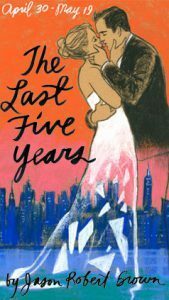 Portland Stage Co. will lead a discussion about their current play The Last Five Years by Jason Robert Brown. This hit musical by Tony award-winning lyricist Jason Robert Brown deconstructs a love affair and marriage between an aspiring novelist and a struggling actress over five years. Told almost entirely through song, this piece moves backward and forward through time weaving the beginning and the ending of a love affair. Participants can enter their name to win a pair of tickets to the upcoming production at the beginning of the discussion. Copies of this play will be available for checkout with your PPL card. You can place a hold HERE. Copies will also be available at the Research Desk, downstairs at the Main Library.